You might want to think twice before you jailbreak your iPhone. Even though jailbreaking your iPhone is now legal, Apple is making moves through patents to be able to actually kill your iPhone if it’s been jailbroken. According to The Register, the application that Apple would like to use to kill jailbroken iPhones, and which was filed in February and published Thursday, specifically describes the identification of “hacking, jailbreaking, unlocking, or removal of a SIM card” so that measures can be taken to counter the user. Possible responses include surreptitiously activating the iPhone’s camera, geotagging the image and uploading it to a server and transmitting sensitive data to a server and then wiping it from the device. So basically if you’re walking around with a jailbroken iPhone, Apple still perceives that as an Apple property and subject to Apple’s terms and conditions. 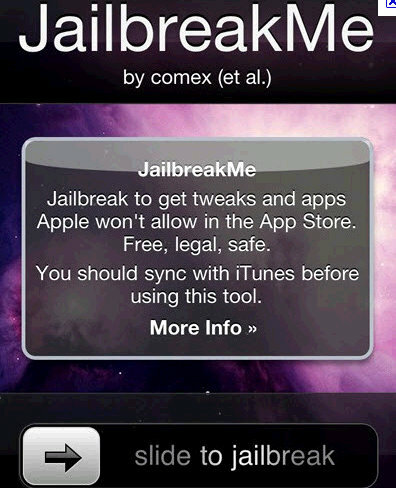 And in the protection of all iPhone users, Apple will simply kill your jailbroken iPhone.